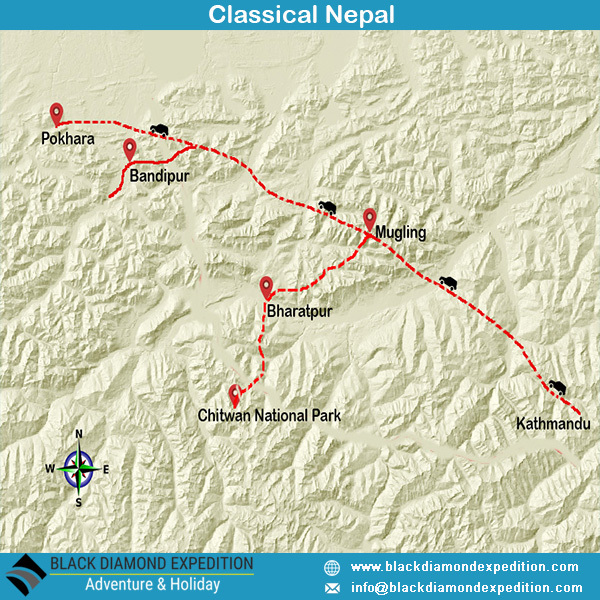 Classical Nepal is especially designed for the city sightseeing providing you with an opportunity of Jungle safari. It is a round trip from Kathmandu for you to discover the colourful world of Nepal. You will have an opportunity to experience the colourful sights and cultural flavor of the distinct regions of Nepal. You will meet the local villagers and craftspeople, visit tranquil temples and sacred Buddhist sites, travel the cobbled streets of tiny mountain towns and search for unique wildlife such as tigers, rhino and deer. Classical Nepal tour provides you an opportunity to experience the diverse landscape, people and culture from the jam-packed city of Kathmandu to the lush green jungle of Chitwan National Park holding plenty of charming hidden gems in between. You will take an unforgettable tokens of memory of the beautiful country, Nepal, an amalgamation of culture, history and natural beauty. One of the representatives from the Black Diamond Expeditions will receive you at the TIA bearing a placard with your name upon your arrival and then you will be transferred to your hotel. After you check into the hotel, our representative will explain you briefly about the program. Depending upon your arrival time, the evening is free for you to explore the streets of Kathmandu where you can sightsee ancient architecture and modern development, rich artistic and cultural heritage as well as crowded markets and bazaars. Your leader will usually organise an optional dinner at one of Kathmandu’s fine Nepali restaurants.Overnight in Kathmandu. Today you will explore Kathmandu on an organised sightseeing tour. In the morning after your breakfast, you will have an extensive pilgrimage tour of Durbar Square, visit Kasthanadap temple, Taleju temple, Kamasutra temple, Palace complex and Living Goddess Kumari. 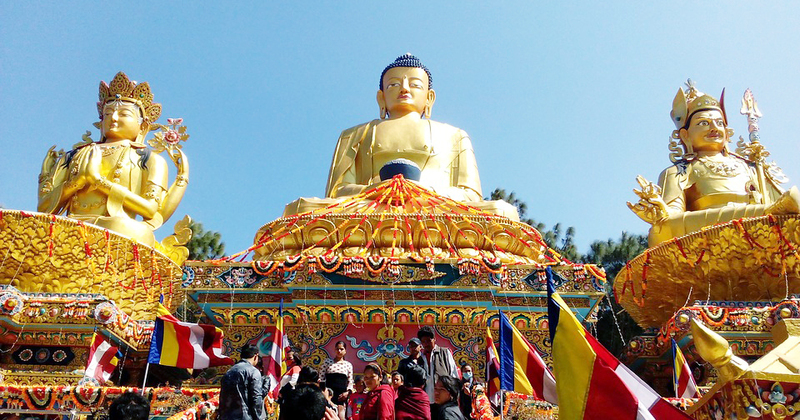 You will also visit Swayambhunath Stupa, where you will enjoy the bird's eye view of Kathmandu Valley and mountains. Later, you will visit two world Heritage sites . First, you will be taken to Bouddhanath Stupa, one of the biggest Buddhist shrines in the world. You will have lunch in one of the restaurants here. After lunch, you will visit Pashupatinath temple, the most famous Hindu temple in the country, located on the banks of the holy Bagmati River. You will witness “cremation” on river banks. Overnight in Kathmandu. After breakfast you will be driven towards Pokhara. After a five hour scenic drive, finally you will reach Pokhara and check into the hotel. Late afternoon you will enjoy boating on Fewa Lake with a marvelous view of Mt. Fishtail and Annapurna. Evening is free and you can stroll along the streets on your own provided you can find the hotel. Overnight in Pokhara. Today is the day to explore Pokhara valley. Early morning, you will have an excursion to Sarangkot hill to witness sunrise view over Annapurna Range. If the weather supports you, you will witness the mesmerizing sunrise. Afterwards, back to hotel for breakfast. Rest for few hours. Afternoon, visit Bindhyabashini Temple, Seti Gorge, Davi’s Fall, Gupteshwor Mahadev Cave and Refugee Camp. in the evening, you are free for personal activities like shopping, traditional massage or just relax in the lakeside. Overnight in Pokhara. If you are an avid wildlife lover, there is an optional early-morning birdwatching safari available today – a worthwhile addition to your trip. After breakfast you will drive on to Bhaktapur (approximately 4 hours), which was once the capital of Nepal and the Great Malla Kingdom during the 15th century. Its rich heritage, inspiring temples and artisanal history played a big part in Bhaktapur being named a UNESCO World Heritage Site. Enjoy an evening of exploration on your own, soak up the lovely atmosphere in one of the local cafes, or simply relax in your hotel. After breakfast, rest of the time is at leisure until we pick you up at the hotel and then transfer to airport for your next stop.